The Twin Cities of Helium are ERB's version of Utopia. Even the name “Helium” itself evokes a light and airy romantic element, and its twin Yellow and Red mile-high towers add to its charm. 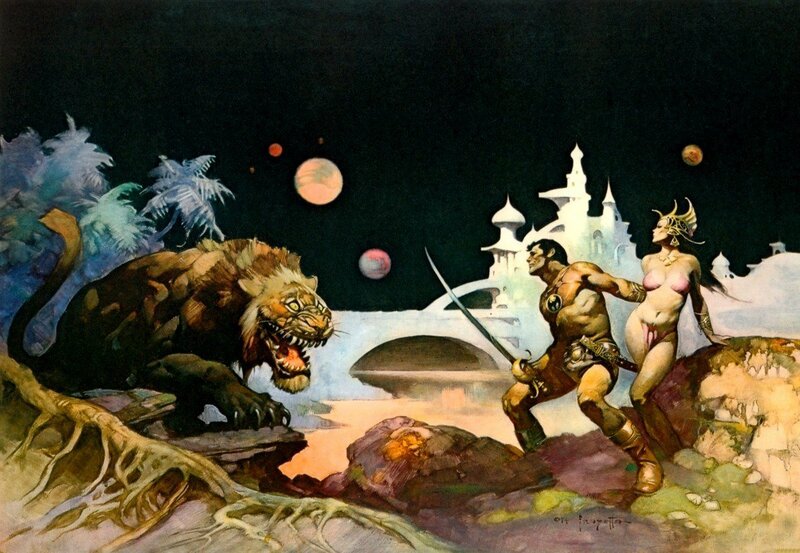 It is no wonder that John Carter turned down being the Jed of Zodanga so that he could live in Helium with his incomparable princess, Dejah Thoris. 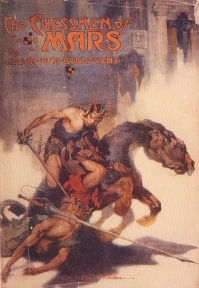 Although Greater Helium – ruled by the great Jeddak Tardos Mors – is described in more detail than Lesser Helium – ruled by Jed Mors Kajak, the son of Tardos Mors and father of Dejah Thoris – a fairly accurate idea of Lesser Helium can be gained by bits and pieces throughout the John Carter saga. 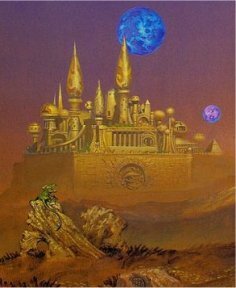 When the picture is complete there should be no argument that the Twin Cities of Helium merit being known as the Second Wonder of Barsoom. “The plain before the city became a veritable shambles ere the last Zodangan surrendered, but finally the carnage ceased, the prisoners were marched back to Helium, and we entered the greater city’s gates, a huge triumphal procession of conquering heroes. “The broad avenues were lined with women and children, among which were the few men whose duties necessitated that they remain within the city during the battle. We were greeted with an endless round of applause and showered with ornaments of gold, platinum, silver, and precious jewels. The city had gone mad with joy. “My fierce Tharks caused the wildest excitement and enthusiasm. Never before had an armed body of green warriors entered the gates of Helium, and that they came now as friends and allies filled the red men with rejoicing. 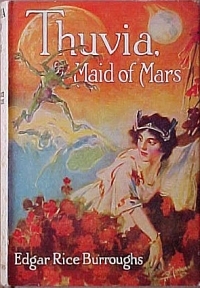 “That my poor services to Dejah Thoris had become known to the Heliumites was evidenced by the loud crying of my name, and by the loads of ornaments that were fastened upon me and my huge thoat as we passed up the avenues to the palace, for even in the face of the ferocious appearance of Woola the populace pressed close about me. “As we approached this magnificent pile we were met by a party of officers who greeted us warmly and requested that Tars Tarkas and his jeds with the jeddaks and jeds of his wild allies, together with myself, dismount and accompany them to receive from Tardos Mors an expression of his gratitude for our services. 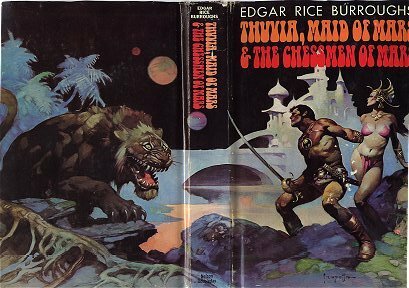 “We were then presented to Mors Kajak, Jed of lesser Helium, and father of Dejah Thoris. He had followed close behind Tardos Mors, and seemed even more affected by the meeting than had his father. “Ten minutes after it touched at the palace a message called me to the council chamber, which I found filling with members of that body. 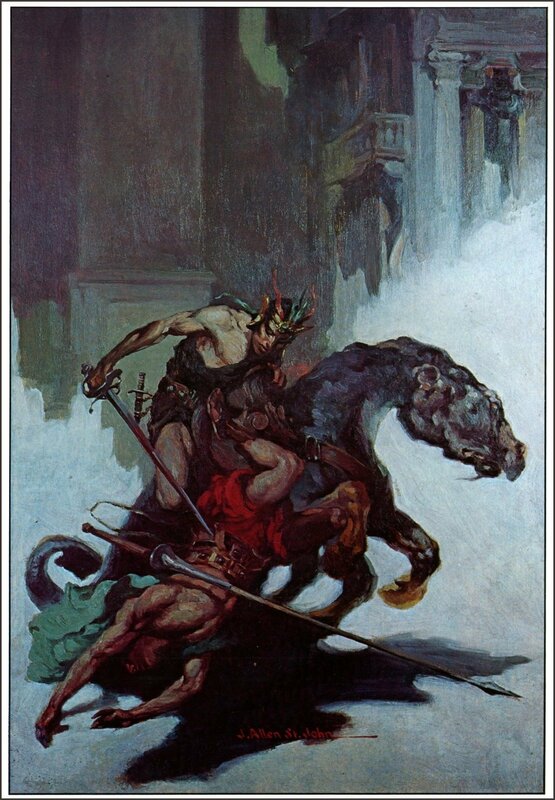 “On the raised platform of the throne was Tardos Mors, pacing back and forth with tense-drawn face. When all were in their seats he turned toward me. 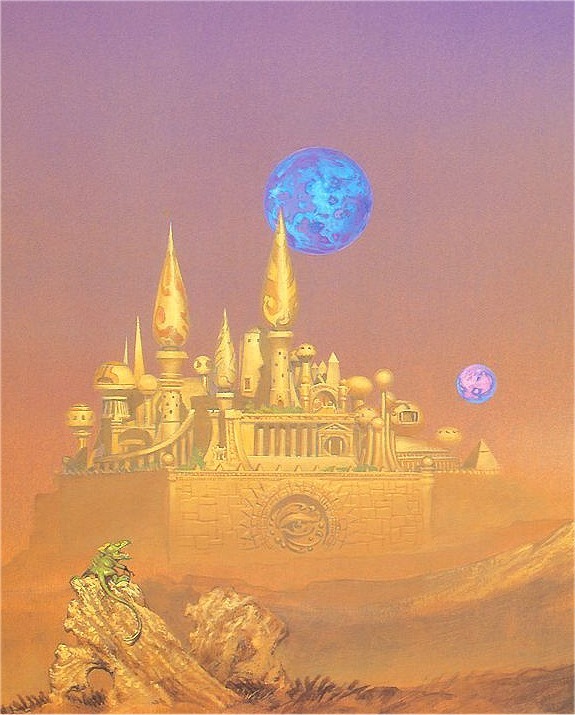 Who killed the keeper and assistant keeper of the atmosphere plant, since all life outside of Okar depended upon it, is a mystery never solved in the John Carter saga. “It was in the forenoon that we arrived above the mile-high scarlet tower which marks greater Helium from her twin city. As we descended in great circles toward the navy docks a mighty multitude could be seen surging in the streets beneath. Helium had been notified by radio-aerogram of our approach. “A few moments before the appointed time on the following morning a strong guard of Zat Arras' officers appeared at our quarters to conduct us the great hall of the temple. “About us the vast circular coliseum was packed to its full capacity. All classes were represented – all ages, and both sexes. As we entered the hall the hum of subdued conversation ceased until we halted upon the platform, or Throne of Righteousness, the silence of death enveloped the ten thousand spectators. “The judges were seated in a great circle about the periphery of the of the circular platform. We were assigned seats with our backs toward a small platform in the exact center of the larger one. This placed us facing the judges and the audience. Upon this smaller platform each would take his place while his case was being heard. “Zat Arras himself sat in the golden chair of the presiding magistrate. As we were seated and our guards retired to the foot of the stairway leading to the platform, he arose and called my name. Carter is chained in a cell beneath the palace occupied by Zat Arras for a full earthly year before being rescued by Carthoris. They raise the fleet, have a glorious war with the First Born and Holy Therns, but on the brink of victory, Dejah Thoris, Thuvia, and Phaidor are locked inside the Temple of the Sun. As we have seen, this all ends in Kadabra with Carter being made Warlord of Mars in the Temple of Reward. “Vas Kor’s destination lay in Greater Helium, which lies some seventy-five miles across the level plain from Lesser Helium. He had landed at the latter city because the air patrol is less suspicious and alert than that above the larger metropolis where lies the palace of the jeddak. “As he moved with the throng in the parklike canyon of the thoroughfare the life of an awakening Martian city was in evidence about him. Houses, raised high upon their slender metal columns for the night were dropping gently toward the ground. Among the flowers upon the scarlet sward which lies about the buildings children were already playing, and comely women laughing and chatting with their neighbors as they culled gorgeous blossoms for the vases within doors. “The pleasant ‘kaor’ of the Barsoomian greeting fell continually upon the ears of the stranger as friends and neighbors took up the duties of a new day. “The district in which he had landed was residential – a district of merchants of the more prosperous sort. Everywhere were evidences of luxury and wealth. Slaves appeared upon every housetop with gorgeous silks and costly furs, laying them in the sun for airing. Jewel-encrusted women lolled even thus early upon the carven balconies before their sleeping apartments. Later in the day they would repair to the roofs when the slaves had arranged couches and pitched silken canopies to shade them from the sun. “Strains of inspiring music broke pleasantly from open windows, for the Martians have solved the problem of attuning the nerves pleasantly to the sudden transition from sleep to waking that proves so difficult a thing for most Earth folk. “Above him raced the long, light passenger fliers, plying, each in its proper plane, between the numerous landing-stages for internal passenger traffic. Landing-stages that tower high into the heavens are for the great international passenger liners. Freighters have other landing-stages at various lower levels, to within a couple of hundred feet of the ground; nor dare any flier rise or drop from one plane to another except in certain restricted districts where horizontal traffic is forbidden. “Along the close-cropped sward which paves the avenue ground fliers were moving in continuous lines in opposite directions. For the greater part they skimmed along the surface of the sward, soaring gracefully into the air at times to pass over a slower-going driver ahead, or at intersections, where the north and south traffic has the right of way and the east and west must rise above it. “From private hangars upon many a roof top fliers were darting into the line of traffic. Gay farewells and parting admonitions mingled with the whirring of motors and subdued noises of the city. “Yet with all the swift movement and the countless thousands rushing hither and thither, the predominant suggestion was that of luxurious ease and soft noiselessness. 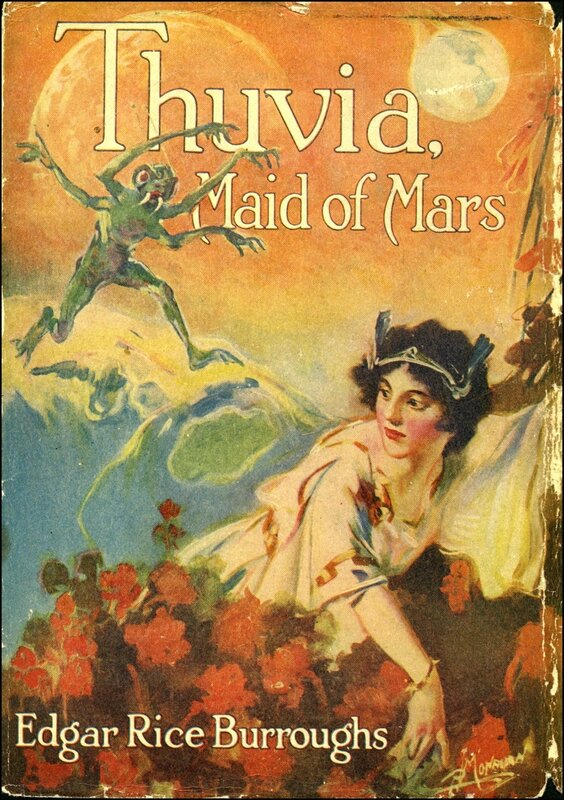 “Martians dislike harsh, discordant clamour. The only loud noises they can abide are the martial sounds of war, the clash of arms, the collision of two mightly dreadnoughts of the air. To them there is no sweeter music than this. “At the intersection of two broad avenues Vas Kor descended from the street level to one of the great pneumatic stations of the city. Here he paid before a little wicket the fare to his destination with a couple of the dull, oval coins of Helium. “Beyond the gatekeeper he came to a slowly moving line of what to Earthly eyes would have appeared to be conical-nosed, eight-foot projectiles for some giant gun. In slow procession the things moved in single file along a grooved track. A half dozen attendants assisted passengers to enter, or directed these carriers to their proper destination. “Vas Kor approached one that was empty. Upon its nose was dial and a pointer. He set the pointer for a certain station in Greater Helium, raised the arched lid of the thing, stepped in and lay down upon the upholstered bottom. An attendant closed the lid, which locked with a little click, and the carrier continued its slow way. “Presently it switched itself automatically to another track, to enter, a moment later, one of the series of dark-mouthed tubes. “The instant that its entire length was within the black aperture it sprang forward with the speed of a rifle ball. There was an instant of whizzing – a soft, though sudden, stop, and slowly the carrier emerged upon another platform, another attendant raised the lid and Vas Kor stepped out at the station beneath the center of Greater Helium, seventy-five miles from the point at which he had embarked. “Five minutes later the merchant was leading his slave to the public market, where a great concourse of people filled the great open space in the center of which stood the slave block. “The crowds were enormous to-day, for Carthoris, Prince of Helium, was to be the principal bidder. “One by one the masters mounted the rostrum beside the slave block upon which stood their chattels. Briefly and clearly each recounted the virtues of his particular offering. “When all were done, the major-domo of the Prince of Helium recalled to the block such as had favorably impressed him. For such he had made a fair offer. “‘What is your name?’asked Lorqual Ptomel, addressing the prisoner. “‘And the nature of your expedition?’ he continued. 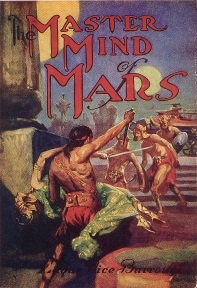 “To Thuvan Dihn he explained that he had been but testing an invention of his own with which his flier was equipped – a clever improvement of the ordinary Martian air compass, which, when set for a certain destination, will remain constantly fixed thereon, making it only necessary to keep a vessel’s prow always in the direction of the compass needle to reach any given point upon Barsoom by the shortest route. “Carthoris smiled. ‘No danger of that,’ he replied. ‘See here,’ and he indicated a device at the right of the destination compass. ‘This is my “obstruction evader”, as I call it. This visible device is the switch which throws the mechanism on or off. The instrument itself is below deck, geared both to the steering aparatus and the control levers. “‘It is quite simple, being nothing more than a radium generator diffusing radio-activity in all directions to a distance of a hundred yards or so from the flier. oncoming vessel is upon a lower or higher plane than herself. The spy, Vas Kor, disguised as a servant of Thuvan Dihn, sees a demonstration of the device. This is why he is later sent to be a slave of Carthoris, so that he can sabotage the device so that Carthoris won’t be able to find Thuvia. But that’s another story. It is my theory, and it is only that, that Zodanga is representative of the Chicago of ERB's day: full of gangsters, political corruption, and every crime imaginable. If that is the case, then the twin cities of Helium may have been inspired by the Twin Cities of Minneapolis and St. Paul, Minnesota. Though not free of crime, they were much cleaner cities. It seems by the time that Vas Kor entered the Twin Cities, Helium had adopted the use of the Marentina ground fliers, for they appear to have been a novelty to Carter when he first observed them. I can see no difference between the ones in Helium and the ones in Okar. Helium is also a place of marvelous scientific inventions. They invented the canal system of Mars and the pneumatic tubes are wonderful in description. I don’t know much about aviation history, but ERB seems to be describing inventions that would later be associated with the automatic pilot and radar. And of course they have the greatest fighting men and the most beautiful women on the planet. Yes, this was ERB's Utopia. 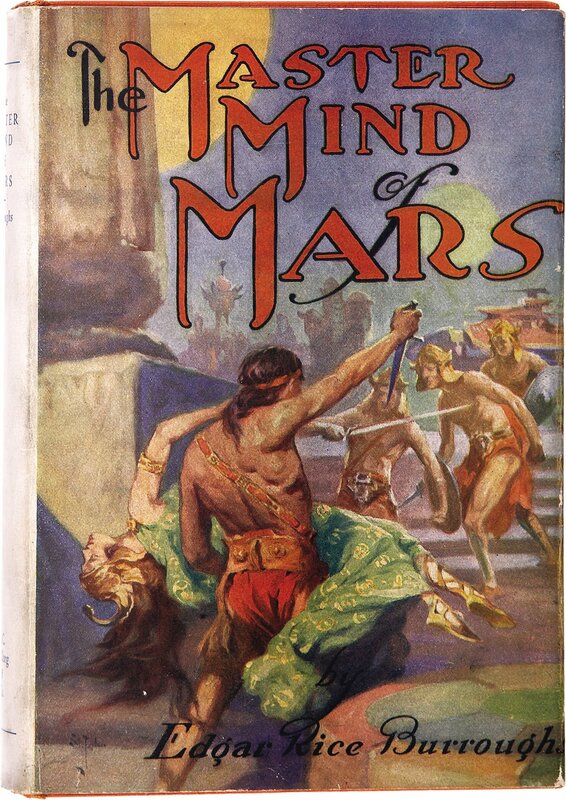 The Twin Cities of Helium: The Second Wonder of Barsoom!